The Melbourne Convention Bureau (MCB) supports organisers of conferences/events held in Melbourne, to attract delegates and promote other leisure activities to enrich the visitor’s experience. The expected outcomes are increased event registration/attendance, and increased economic activity in Melbourne and surrounding areas from visitation. 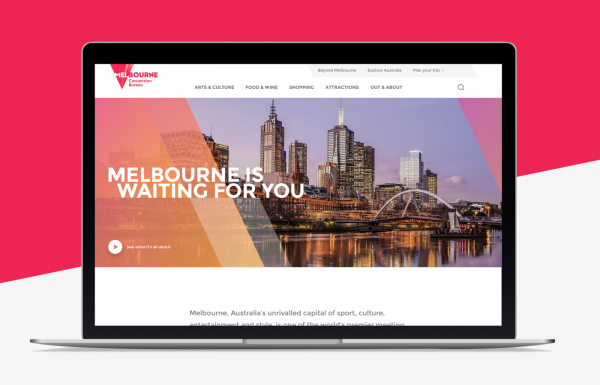 The key digital asset previously being used to support the promotion of Melbourne and related leisure activities around conferences was the 'Melbourne Widget'. 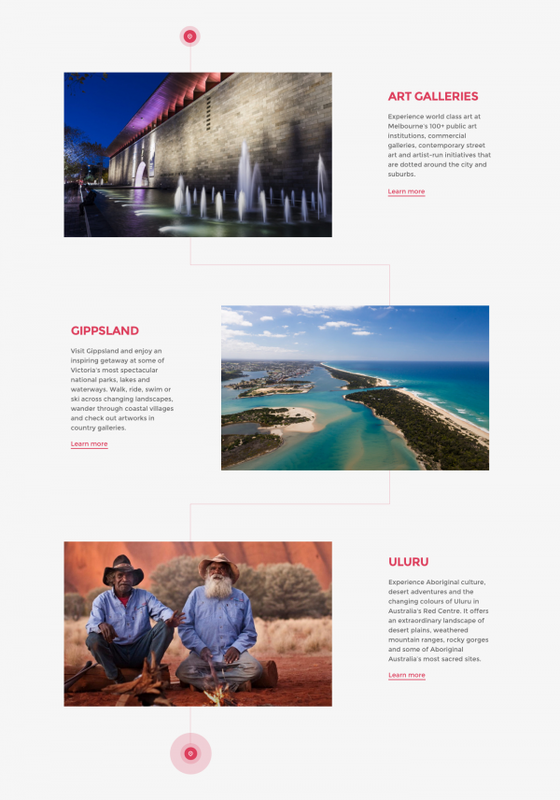 This was embedded in a conference website, and via a modal window it contained video, imagery and content about visiting Melbourne. Unfortunately this approach was dated, not responsive to devices, and by operating within a modal window, was difficult to use. Evolution 7 was engaged to reimagine the way Melbourne was presented to conference delegates, and provide a more immersive, content-rich and informative experience to those wishing to explore more about what the city and surrounding region has to offer. We developed the visitation experience as a microsite, invoked from a conference website, but with a richer and more flexible user experience. Drawing upon our considerable experience in building compelling and award-winning user experiences, and our expertise in the travel and tourism sector, we developed a comprehensive website that ingests and publishes the event and operator data available from third-party sources. This massively reduces the time required to create and curate content, makes marketing a breeze, and ensures the website always serves current and relevant content to users. A key deliverable of MCB’s activities is an increase in conferences and events held in Melbourne and driving ongoing increases in the number of delegates attending. There are a number of factors that influence ‘delegate boosting’, but the perception and marketing of the destination as a desirable location is a key component. MCB wanted to showcase a broad range of activities, experiences, dining options and tours on offer in Melbourne; but with a large number of high-quality options available, MCB didn’t have the capacity to create the unique content for each venue, gallery, bar, restaurant, and boutique in Melbourne. 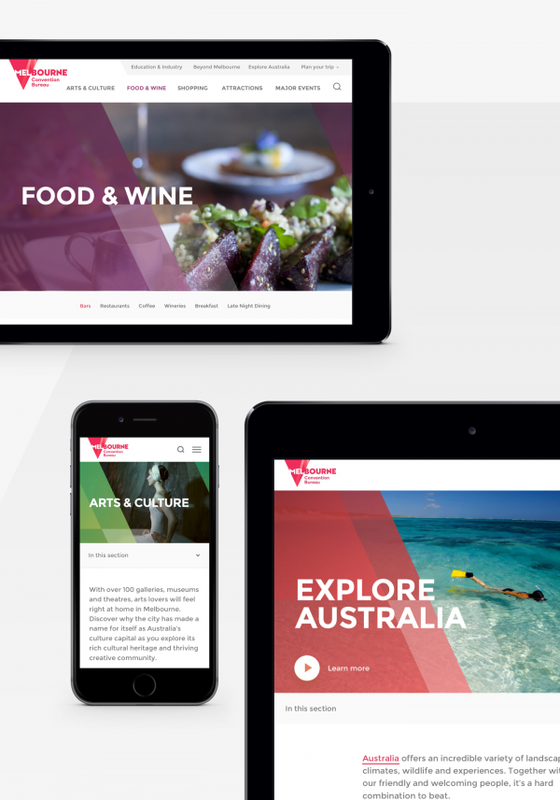 Therefore, MCB required that the experience utilised the Australian Tourism Data Warehouse (ATDW) database of content - a repository of many listings of tourism and related services from across Australia. An easy to use content management platform was a key requirement, as MCB would need to supplement ATDW listings with a smaller amount of content which they themselves would create and enter. 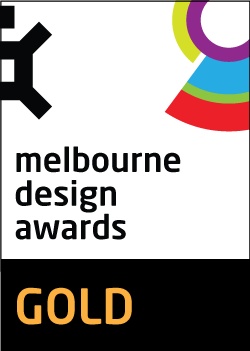 The ‘Melbourne Widget’ was dated, provided limited content management opportunities, and was failing to sell Melbourne as a diverse and exciting destination. With the quality of the destination being a significant factor in potential delegates decision to attend a conference, whether a partner or family will join them, and whether the visit will be extended pre- or post- conference, a successful visitation marketing effort can result in significant economic activity for a destination. Evolution 7 was tasked with conceptualising a new visitation experience, and designing and executing this to deliver a rich, immersive and vibrant digital representation of Melbourne and it’s offerings to visitors. 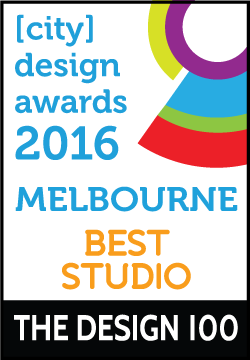 We crafted and built a modern, vibrant and immersive website to showcase all that Melbourne has to offer. 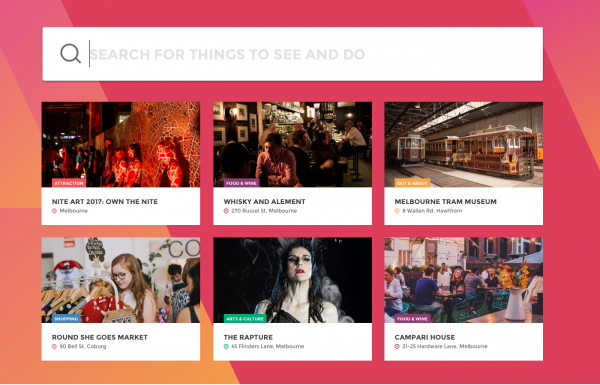 With a combination of information about venues, shops, dining options and attractions, and editorial and curated content, the Melbourne visitability website for MCB allows potential delegates to plan their time in Melbourne - and perhaps a holiday as well. The ideal “visitability” experience presents a mix of both location- and destination-specific content, and a blend of editorial and curated articles and recommendations. The MCB site presents both in a structured and engaging manner, with a range of suggestions & itineraries but also providing powerful search tools for the self-guided user. 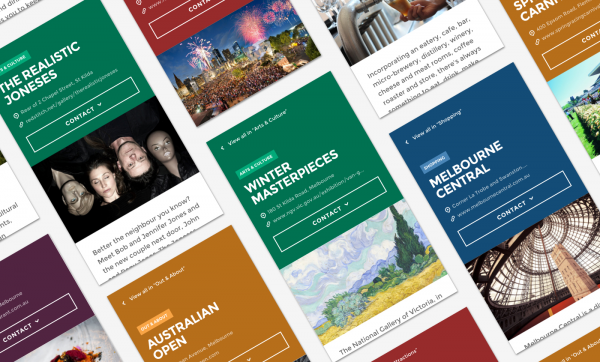 With a range of flexible content components used, the content structure allows for the presentation of curated content selections, like the best shops for locally made products, laneway and arcade experiences, and where to go for the best coffee in Melbourne. As a result, the user journeys support discovery and exploration. With a bold diagonal motif applied across the site, borrowed from the MCB’s updated branding, the visual language of the site communicates vibrancy, movement and excitement. igh quality photography is critical for placing the viewer straight into the location and eliciting the “desire to see”. The site layout features photography prominently throughout the experience, showing off both the well-known locations , but also the local gems. Well-considered navigation prioritises Melbourne content, with practical resources also available to users, such as navigating public transport, and suggested itineraries for those wishing to explore, with initeries custom designed for busy conference delegates - what to see in a few hours, a half day, or just the evening. The MCB visitability website is somewhat unique for a visitability website where the marketing effort is heavily focused on a key target audience - conference delegates. As the website is not intended to be readily available to other audiences, the site is not crawled by search engines, and the primary traffic sources are therefore conference delegates or their family/travel companions. Underpinning the experience is a sophisticated technology platform that allows MCB to simultaneously capture and explore customer data insights, giving the ability to shape future content or features based on user insights. The website doesn't gather any user data. Served over SSL, if users are interested in a particular event or operator, they are able to click out of the site and explore the relevant third-party website.